At TMS invoicing takes place on the 7th working day of the month, the majority of the carriers supply monthly CDRs by the 4th working day so this date enables us to 'clean' the data where required, generate the invoices and send them out in your preferred format. Your invoice template is created for you in your corporate colours with all of your company details and logos, so your name is in front of your customer every month. 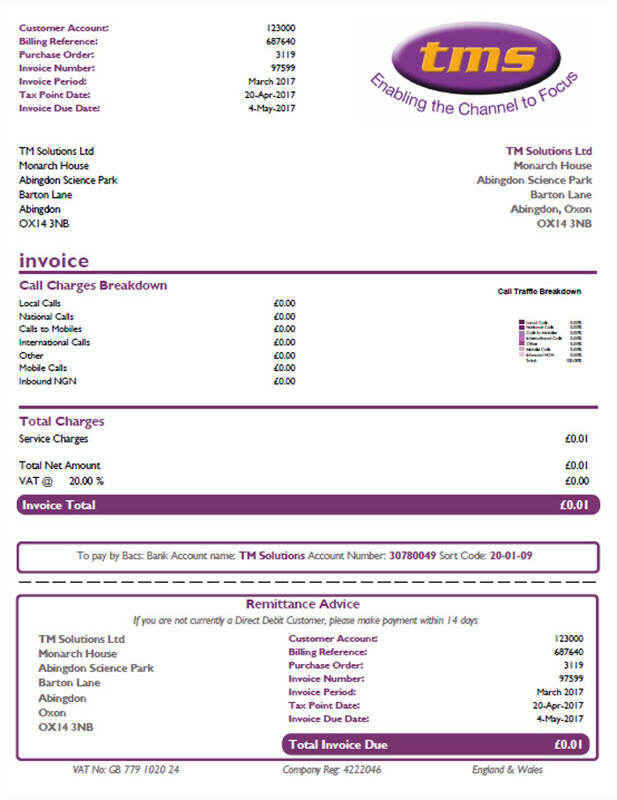 Messages can be added to your invoice, we can insert mailers and perform E-shots to your customer base. All products are charged to your customer on the one invoice at your selling rate. 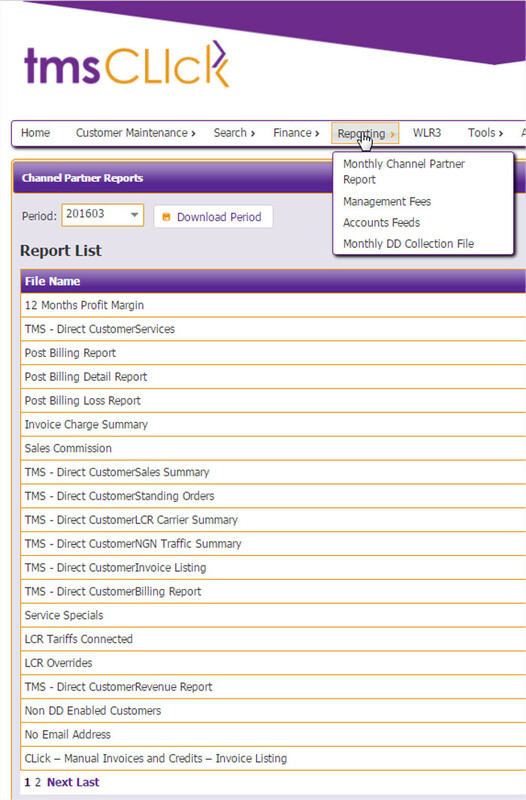 You can specify minimum billing amounts and itemisation levels, call plans, free minutes, bundling and call capping are all functions available. You have the use of TMS (Telephone Management Service) Direct Debit collection service for all clients either by DD or paperless DD service. Our internal accounts department run the Direct Debit service we provide, If you have an existing DD service in place we are able to perform a bulk transfer from your current DD scheme to our bank (Barclays) and generate a letter to be sent to your customer for you. We set up a sub account off our account at Barclays which we label: resellername-TMS, this is where all your customer collections are deposited. The name of the account is what will appear on your customers' bank statement so the customer will still see the DD is collected by your company. The DD collection will be 14 days after your invoicing date unless you have a preferred date, we then deduct your charges from the amount collected and 3 working days later the money is transferred as cleared funds into your bank account. For new DD customers we will provide you with DD Mandates and can also offer a paperless Direct Debit service. Before collecting the monthly direct debits a listing is sent to you to check the amounts to be collected and to give you the opportunity to add or remove any collections. We can collect card payments from your customers over the phone or by submitting a simple form; this means no more chasing payments and could significantly increase your cash flow. If a customer has a Direct Debit bounce or you have an additional monthly payment to collect you can utilise this service. Once customer card details are received the payment will be processed on the same working day. Confirmation of the customer payment will be emailed to you. We will inform you if the transaction has been successful or has been declined. Once we have received the funds into our bank account, we will repay this into your designated account within 3 working days. Payments are collected in the name 'i-bill charges'. You will receive an electronic feed for your accounting packages of all invoice information, which includes all invoices raised, credits and a direct debit feed. Once your clients have been invoiced – emailed or printed, packed and posted, your management reporting documents are produced. These documents are published onto TMS CLIck for designated personnel to view. We are also able to run any bespoke reports you may require, however further costs may be involved.